On Leica camera, a 24mm lens is pretty wide. This 24 Elmar lens is the least expensive, but best feeling lens of the bunch. It’s small, light, and the build is top-quality. This lens is for those photographers looking for an incredible wide angle for daylight landscape or travel photography. this lens is super sharp with excellent performance across the entire aperture range. The 24 Elmar is a gem of a lens. It has a solid build, a smooth, but solid aperture dial, a nice compact metal screw-on hood (that actually STAYS on the lens), and the cool part is that you get mega lens performance in a pretty small package. 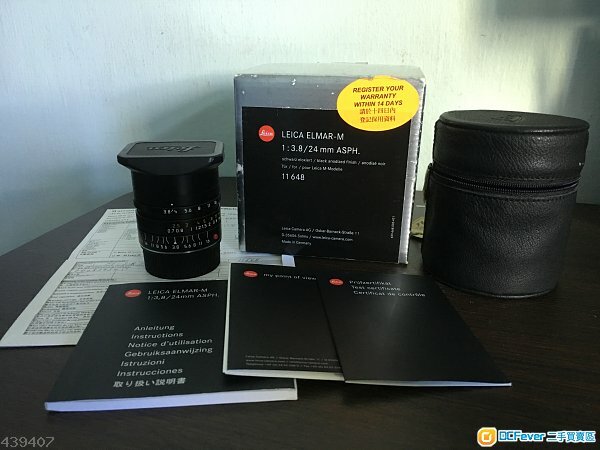 If you are in the market for a 24mm for your Leica M, whether that be a digital M9, M10 or even a film MP, M6, or M7, then the 24 Elmar should be on your list. My lens was bought brand new from authorized Leica agent (I still have the invoice) and I rarely used it, hence it is over 96-97% new with almost no sign of use. Glass condition close to perfect, no haze, no fungus, no oil on aperture blades. Made in Germany with 6 bit coding.